Kedgeree is an English dish, typically served for breakfast, that originated in India. 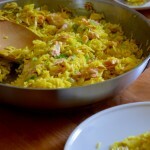 The Indian dish that inspired kedgeree is a dish of rice and lentils. However, its English reincarnation is typically made with smoked fish. It’s a fantastic way to stretch a small portion of fish. The flavors pack a punch and would make a great, unexpected dish to serve for brunch. The way that I’ve prepared it here requires only one pan, so clean up is a cinch. Heat the olive oil and butter in a medium sauté pan over medium heat. Add the onion, fresh ginger and sea salt and sauté for minutes or until the onions are slightly translucent. Add the basmati rice and stir to gloss the grains of rice with the onion mixture. Add the turmeric, garam masala and ground ginger, and give the pan a quick stir. Add 2¼ cups of hot water to the pan, being cautious, as the pan will bubble and spit. Place the salmon fillet into the center of the pan and bring the pan to a boil. Reduce the heat to a simmer and cover until the rice and salmon are fully cooked, about 10 minutes. 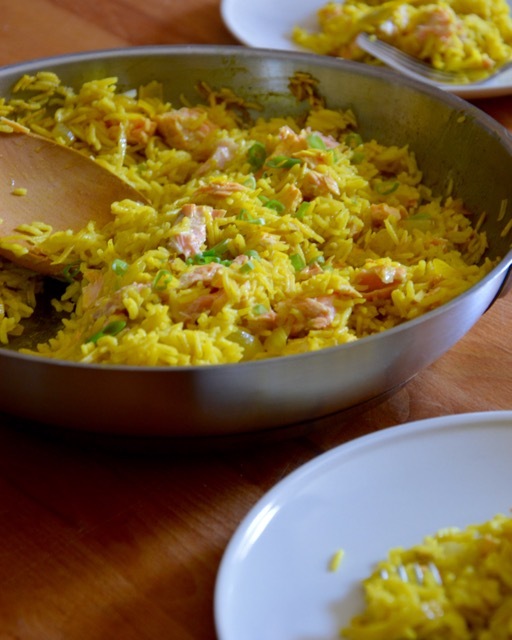 Once the rice is cooked, remove the skin from the salmon and flake the fillet by using two forks. At this point, should the fillet not be fully cooked, flaking it into the hot rice will help it along. Add the fish sauce and lime juice and give it one last toss. Garnish with green onion and serve immediately.